If you are looking for a screening plant Bamboo is well worth consideration. However the many varieties available for sale from specialist nurseries, this is a plant that offers the landscaper and gardener a lot more possibilities. With some many different types, including some with large culms, some with weeping habits and others with colourful culms ranging from green and yellow, through to red and black. This is a plant that can also be used as a feature plant in the garden and also grown in containers. Varieties include clumping or non invasive as well as running bamboo. Specialist nurseries have a good range of plants for sale, different colours, culm size, height and foliage habit. In terms of colour, Black bamboo is a very popular type in Australia, however the golden yellow of other species can add much needed color in winter. while the weeping types make graceful feature plants. However it seems that all varieties used for screening. Many of the less vigorous species may be grown in pots or containers and some varieties are suited to indoor use in a well lit situation. We provided a guide to mail order and specialist bamboo nurseries in Australia. These are the most popular type of bamboo for landscaping uses in both commercial and domestic applications are the clumping varieties. With relatively shallow root systems clumping varieties are not invasive like many other types. Fast growing clumping varieties can provide a great screen or feature in the garden and once established most species are reasonably drought tolerant. One of the big problems is the invasive or running species. These are the plants that have rhizomes that will travel underground and appear as new shoots some distance from where it was planted. A few species are noted for this characteristic and include the well known Phyllostachys pubescent, Phyllostachys aura and Phyllostachys nigra and despite what is said about root barriers we suggest only growing these in pots or containers. Qiongzhuea tumidissinoda or “Chinese Walking Stick” most if not all Pleioblastus species, the Yushania and Semiarundinaria types along with the Chimonobambusa and Arundinaria types are are all running bamboos. Bamboo is used widely as a screening plant and is an important part of Japanese Garden design. Landscapers love to use it is quick growing and will provide a great screen. Grown in pots it can provide a dramatic focal point for a small courtyard. Other uses include to provide shoots for culinary use, decorative poles for fencing and construction. So if you really need to grow a running variety then either be prepared for it to eventually do what it does best, run, or plant it in a container. Methods such as removal of new shoots and root pruning are really not effective in the long term. Root barriers will work if you are prepared to put one in that is 1m deep, however even these can break down and bamboo runners have a way of finding any gap that appears, and even the best root barrier can break down over time. So if you must grow running types, try a planter box. 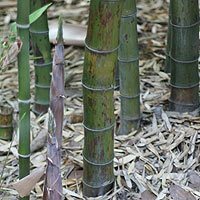 Generally easy to grow, bamboo plants can be propagated by dividing existing clumps. All species spread naturally by underground rhizomes, so the easiest approach is to remove young new shoots complete with roots from the outside of the clump. Many growers will actually remove some slightly oder growth with the new growth as this older growth will have a better root system leading to faster growth. Nearly all species like a well drained soil, but plenty of water, so when planting out make sure that you water in well and then water regularly until established. Applying fertiliser will stimulate growth and a fertiliser with a high nitrogen percentage (look for N.P.K on the packaging) will be useful once the plants have had time to settle in. Varieties are widely used as both screening plants where their upright growth habit makes them ideal for narrow or confined spaces and as feature plants in Japanese or Balinese styled gardens. It comes in both ‘running’ and the more popular ‘clumping’ style of plant. Species also have very different growth habits depending on species and the climate hay are planted in. Plants available in Australia also come in a range of colors with black being very popular. Different species also grow to different diameters, some are very large other small. These are an ideal plant for containers and are often a feature in commercial shopping centers in a well lit indoor situation. We provide a guide to the different types of bamboos as well as contact details of suppliers all over Australia. Did you know that the timber is very popular as a flooring material ? Wholesale and retail, for the northern NSW coast areas. Black, Green, Gold, Hedging, Screening , Ornamental, non-invasive varieties and much more. Specialist nursery. Specialise in bamboo for privacy screens.